Dean Cornwell, often referred to with the appellation “The Dean of Illustrators” tacked on, was a second generation inheritor of the Brandywine tradition of illustration, having studied with Harvey Dunn, a student of Howard Pyle and an eminent teacher in his own right. Cornwell carried the Brandywine traditions of bold figures, bright colors and dynamic compositions forward, but blended them with influences he gathered from Frank Brangwyn, with whom he also studied, to create his uniquely powerful style. Brangwyn, among his many talents, was a noted muralist, and Cornwell adopted the muralist technique of surrounding figures with strong outlines to great effect, both in his own murals and in his illustration work, giving it a forceful graphic framework within which he plied the lessons of the Brandywine school that he had acquired from Dunn. Cornwell said that he considered himself a “grand-student” of Pyle, and would often quote Pyle’s aphorisms about painting that he had picked up from Dunn. Cornwell had a successful career as an illustrator but had a passion to become a muralist. At one point took three years off and traveled to England to study mural painting with Brangwyn prior to fulfilling a commission to create his now famous murals for the Los Angeles Public Library. Cornwell went on to create notable murals across the country. Leif Peng has a good article about Cornwell’s murals for the Warwick Hotel, as well a more general article on Cornwell on his always terrific Today’s Inspiration blog; and has also generously posted a terrific Flickr set of Cornwell’s work that contains the highest resolution Cornwell images I’ve seen on the web.. The Warwick murals were restored in 2004 and have become the centerpiece for a new restaurant at the Warwick called Murals on 54. The restaurant’s site has a nice image gallery. The murals themselves became the center of a dispute between Cornwell and William Randolph Hearst, who had commissioned the images of Sir Walter Raleigh and Queen Elizabeth I for the Raleigh Room in his new apartment hotel. The apparently bitter disagreement was over compensation for the work. I’ll quote, as Peng has, from the history on the Murals restaurant site: Enraged and seeking revenge, Cornwell painted images, at the time considered obscene, onto the murals. Due to the controversy, one mural was covered for more than 40 years. The concealed mural included a man urinating on the queen and another man urinating on Sir Walter Raleigh. Another pictured an Indian with bare buttocks. The dispute was eventually settled and Cornwell painted out one of the obscenities but the others remained. (The page with the full story has been moved since Peng’s post and is now located here.) Hmmm… never cross a muralist while he still has access to your wall. Cornwell’s images can seem very controlled at times, but they resonate with a vibrant strength and sculptural dimensionality that is unique. Particularly fascinating are his drawings, which utilize a dramatic bold outline style that would be of particular interest to students of comic book art and related illustration. The image above, Serving the Nation, isn’t Cornwell at his strongest, but seemed appropriate for Labor Day. It’s from the Pennsylvania Railroad’s 1943 Calendar. 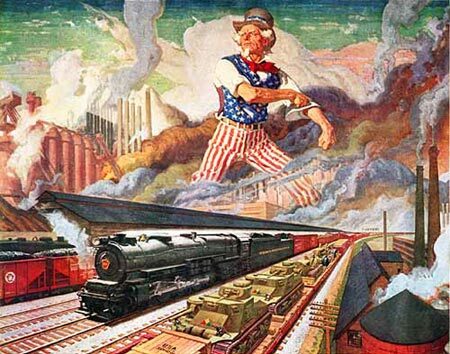 The 1944 calendar had a similar piece, Forward, in which the domestic duties of the railroad are paired with images of the the war effort. I had the pleasure of stumbling on what I assume is a preliminary study for the bottom half of that image at the Newman Galleries here in Philadelphia. I’ve also see a Cornwell study in the collection of a friend, and his work is remarkably painterly close up. Dean Cornwell: Dean of Illustrators, the most comprehensive book on the artist, was reprinted in 2000, but is currently out of print and expensive on the used book market, particularly considering the percentage of works that are not reproduced in color. Some alert publisher out there needs to pick up on the fact that we need some new books on illustration greats like Cornwell and Leyendecker. Thanks for the comments, Li-An. True, there are other, more representative, images of Cornwell’s that I could have chosen. I picked this one because today is the Labor Day holiday in the U.S., and this image seemed appropriate. One of the more astounding resources on Cornwell that I’ve seen recently is a film made by Cornwell’s student Frank Reilly as part of Reilly’s “Artist at work” series. The original 16mm film is in color and soundâ€”â€”impressive technology for the day. The film shows Cornwell in 1947 puffing for a second on his cigar and then reading a prepared statement about his ideals for illustration. And then he demonstrates his amazingly confident left-handed layin procedure using India ink and umber washes to establish “The Fight at Minowa,” one of his illustrations for The Robe by Lloyd Douglas. The great illustration teachers Steve Kloepfer and Chuck Pyle of the Academy of Art University in SF know more about these long lost Reilly films. I understand that because of rights issues, this material can’t be released widely but I hope the rightsholdersâ€”â€”whoever they areâ€”â€”decide to share the films of Cornwell, Dunn, Crandall, Gruger and others on YouTube some day, because I believe that is what Reilly and his subjects originally intended. Wow. It’s great just to know that these resources exist! Thanks! I certainly hope the films are at least being preserved digitally. It would be terrific to have them avaliable. I would particularly love to see films of Dunn teaching, if they exist. Labour day ? I’m not enough aware of American culture, sorry for that :-) I have to post something about Cornwell one of this day on my blog. Other readers should check out Li-An’s blog, which covers a wide range of topics in illustration and comics from a French perspective. Howard Pyle is just a gorgeous author. I too had the privilege of coming across the piece “Forward” form the 1944 calendar when it was at the Newman Gallery in Philadelphia. I asked one of the gallery employees about it. She informed me that unfortunately that it was the original, and that the top had been cut off at some point. Its a real shame for such an iconic image to suffer that fate. Unfortunate. I wonder if a previous owner thought they could get more for two separate paintings.